Sun exposure is the leading reason for fine lines, dark spots and skin aging. 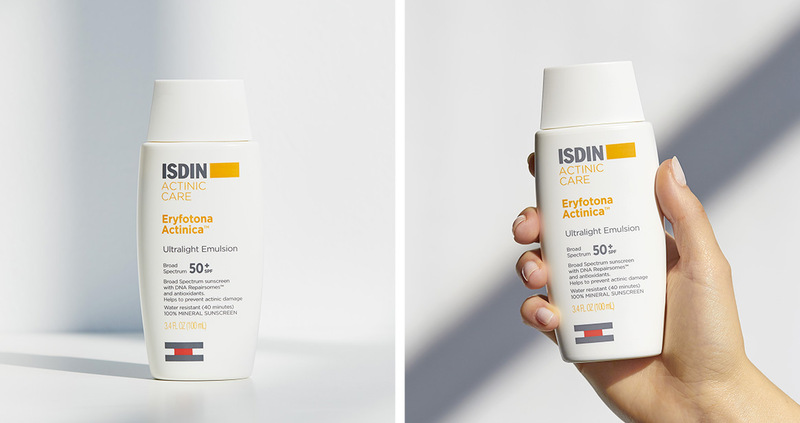 For daily protection and to help address previous sun damage, apply Eryfotona Actinica, formulated with DNA repairsomes and vitamin E. It is a 100% mineral based sunscreen designed to have a light weight consistency with broad spectrum UVA/UVB protection that won't leave your skin feeling greasy. Apply the equivalent of 2 finger-lengths on your face and neck 15 minutes before sun exposure. During sun exposure, reapply after 40 minutes of swimming or sweating, immediately after towel drying and at least every 2 hours. Help repair previous sun-induced damage. Antioxidant that helps protect against environmental damage. Broad Spectrum UVA/UVB mineral sunscreen that offers very high protection. Active ingredient: Zinc Oxide (11%) as a Sunscreen. Inactive ingredients: Water, Diethylhexyl Carbonate, Dibutyl Adipate, Cyclopentasiloxane, Dicaprylyl Carbonate, Alcohol Denat., Cyclohexasiloxane, Butylene Glycol, PEG-30 Dipolyhydroxystearate, Nylon-12, PEG-10 Dimethicone, Dimethicone, Sodium Chloride, Phenoxyethanol, Disteardimonium Hectorite, Triethoxycaprylylsilane, Tocopheryl Acetate, Glyceryl Stearate, Fragrance, Bisabolol, Disodium EDTA, Ethylhexylglycerin, Panthenol, PEG-8, Tocopherol, Lecithin, Plankton Extract, Ascorbyl Palmitate, Ascorbic Acid, Citric Acid.